I was teaching Sebastian the addition facts that equal 10. For some reason he was being frustrated by what I was doing, so on my feet I came up with the ten family. 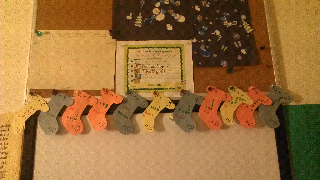 We made stockings for each equation and he "decorated" each stocking to find the missing number. 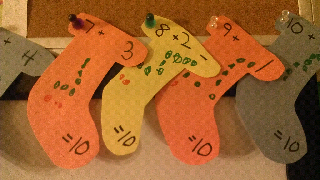 For instance, one of the stockings was 3+_=10. He had to find the missing number. In a green marker he added 3 decorations. In a red marker he added enough to total 10 and then counted how many he made in red and wrote in the answer. We did 11 total, (10+0, 9+1, 8+2, through 0+10) and he loved doing it. Necessity is the mother of invention. I am glad my brain worked, otherwise we could have had waterworks.